Bleed for This is a 2016 American biographical sports film written and directed by Ben Younger and based on the life of former world champion boxer Vinny Pazienza. The film stars Miles Teller as Pazienza, with Aaron Eckhart, Katey Sagal, Ciarán Hinds, and Ted Levine in supporting roles. The film had its world premiere at the 43rd Annual Telluride Film Festival on September 2, 2016, and was released in the United States on November 18, 2016, by Open Road Films. On November 1988, Vinny Pazienza boxes Roger Mayweather for the WBC World Light Welterweight Title. He arrives late to the weigh-in, as he has been riding a stationary bicycle in order to make the weight limit. Vinny's final weight is 140 pounds even, which qualifies him for the fight. Instead of resting up for the fight, Vinny spends the night at a casino. The following day, he loses to Mayweather. At one point during the fight, Vinny is hit after the bell. His boxing manager Lou Duva causes a scene by going after Mayweather, but is punched as a result. Following the match, Duva tells the media that Vinny should retire from boxing. This angers Vinny's father Angelo (who serves as his coach), and he confronts Duva. In the ensuing argument, Vinny announces that he wants another fight, and hires Kevin Rooney as his coach. Angelo receives confirmation that Vinny has been granted a title fight against Gilbert Dele. Vinny wins the bout via technical knockout, which makes him the WBA World Light Middleweight champion. Some days later, Angelo tells Vinny that he will be fighting Panamanian boxer Roberto Durán. Vinny is pleased, and gets in a car with his friend Jimmy to get some coffee. On the way, they are hit head-on by an oncoming car. Jimmy is hurt, but Vinny suffers a critical neck injury. As he regains consciousness in the hospital, the doctor informs him that he might never walk again, and will certainly never fight again. He offers to better Vinny's chances of walking by performing a spinal fusion. While this would guarantee that he can walk again, it would limit movement in his neck. Thus, boxing would be out of the question. Against his doctor's recommendation, Vinny opts to be fitted with a Halo, a medical device in which a circular metal brace is screwed into the skull in four spots, and propped up with four metal rods. This would allow him to regain movement in his neck, which could allow him to box again. Despite Vinny's optimism, the notion is rejected by Kevin. Disobeying his doctors' advice, Vinny begins to work out in his basement. He tells Kevin, who agrees to help him. Angelo eventually catches them, and kicks Kevin out of the house. Six months after the accident, Vinny is ready to have the halo removed. He chooses to endure the pain of having the screws removed without taking any sedatives. In his comeback match, it is confirmed that Vinny will fight against Durán. The fight is held in Las Vegas, in 1990. In the first six rounds, Vinny is overpowered by Durán. Then suddenly — inspired by his own tenacity — Vinny lands a good punch late in the fight. Vinny eventually wins, via 12-round majority decision (114-114, 115-113, 115-113). In the final scene, Vinny is interviewed by a journalist. She asks him about the biggest lie he was ever told as a boxer. Vinny pauses, then says the biggest lie is, "It's not that simple". Professional boxers Peter Quillin and Edwin Rodríguez appear as fighters Roger Mayweather and Roberto Durán, respectively, while Godsmack singer Sully Erna plays a Blackjack dealer at Caesars Palace. In September 2010, it was announced Angelo Pizzo had signed on to write the film, with Chad A. Verdi, Noah Kraft, and Glen Ciano producing while Michael Corrente would direct the film. In 2011 Verdi sent Kraft to meet with Martin Scorsese after an introduction from Senator Sheldon Whitehouse. Mr. Scorsese agreed to partner with Verdi and Kraft on the project and signed on as an executive producer. In 2012, Verdi and Kraft hired Ben Younger to write and direct the feature. In September 2014, it was announced that Miles Teller, Aaron Eckhart, Amanda Clayton, Ciarán Hinds, and Katey Sagal had joined the cast of the film, with Ben Younger directing from a screenplay he wrote, while Scorsese and Emma Koskoff Tillinger, Bruce Cohen and Pamela Thur-Weir serving as producers. In December 2014, Tina Casciani joined the cast of the film. Aaron Eckhart gained a reported 45 pounds for the role of Kevin Rooney. on November 10, 2014, in Warwick, Rhode Island. On December 10, filming took place at Twin River Casino in Lincoln, Rhode Island. On December 16 and 17, filming took place at Dunkin' Donuts Center in Providence. On July 27, 2017, Vinny Paz filed a formal lawsuit against filmmakers Ben Younger and Chad A. Verdi, citing forgery and failure to pay $175,000 of the promised $300,000 payout for the rights to his life's story. In February 2015, the first image of Teller was released. In May 2015, Open Road Films acquired distribution rights to the film. The film had its world premiere at the 43rd Annual Telluride Film Festival on September 2, 2016, before screening at the 2016 Toronto International Film Festival. Originally, the film was scheduled to open in a limited release on November 4, 2016, before opening wide on November 23. In October 2016, the film was rescheduled to have a wide opening on November 18, 2016, forgoing a limited release. Bleed for This opened alongside Fantastic Beasts and Where to Find Them and The Edge of Seventeen, as well as the wide expansions of Moonlight and Billy Lynn's Long Halftime Walk, and was initially expected to gross around $5 million from 1,549 theaters. After grossing less than $900,000 on its opening day expectations were lowered to $2–3 million; it ended up debuting to $2.4 million, finishing 8th at the box office. In its second weekend the film dropped to 17th at the box office, grossing $949,898 (a drop of 59%). On review aggregator Rotten Tomatoes the film holds an approval rating of 71% based on 113 reviews, with an average rating of 6.3/10. The website's critical consensus reads, "Bleed for This rises on the strength of Miles Teller's starring performance to deliver a solid fact-based boxing drama that takes a few genre clichés on the chin but keeps on coming." Metacritic gives the film a normalized score of 62 out of 100, based on 34 critics, indicating "generally favorable reviews". Audiences polled by CinemaScore gave the film an average grade of "A–" on an A+ to F scale. ^ "Bleed for This (15)". British Board of Film Classification. August 15, 2016. Retrieved August 17, 2016. 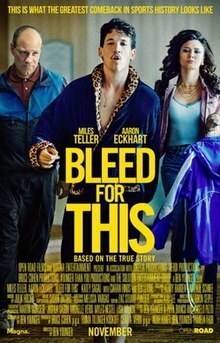 ^ a b "Bleed for This (2016)". The Numbers. Retrieved March 30, 2017. ^ McNary, Dave (September 21, 2010). "Scribe dons gloves for boxing bio". Variety. Retrieved July 28, 2016. ^ Smith, Andy. "In promoting his film, Paz says, 'My life has always been a movie…'". providencejournal.com. Retrieved 25 October 2017. ^ Winfrey, Graham. "Frequent Fliers, Rejoice: These High-Tech Earbuds Can Cancel Out Even a Baby's Crying". Inc.com. Retrieved 25 October 2017. ^ McNary, Dave (19 January 2012). "Verdi, Kraft sign Younger to helm 'Paz'". Variety. Retrieved 25 October 2017. ^ Fleming Jr, Mike (September 17, 2014). "'Sons Of Anarchy's Katey Sagal Mothers Vinny Pazienza In Fight Pic 'Bleed For This'". Deadline Hollywood. Retrieved July 28, 2016. ^ Team, The Deadline (December 17, 2014). "Michael Roark Joins 'Wild For The Night'; Tina Casciani Cast In 'Bleed For This'". Deadline Hollywood. Retrieved July 28, 2016. ^ Parade Magazine. November 27, 2016. p. 3. ^ Carpano, Frank (November 13, 2014). "Filming begins in RI on Vinny Paz biopic". turnto10.com. Retrieved November 13, 2014. ^ "Extras needed in Rhode Island for 'Bleed for This'". onlocationvacations.com. November 5, 2014. Retrieved November 13, 2014. ^ "More extras needed in RI for 'Bleed For This'". onlocationvacations.com. December 5, 2014. Retrieved December 6, 2014. ^ McClintock, Pamela; Ford, Rebecca (February 5, 2015). "See the First Image of Miles Teller in 'Bleed for This' (Exclusive)". The Hollywood Reporter. Retrieved July 28, 2016. ^ McNary, Dave (May 17, 2015). "Cannes: Miles Teller's Boxing Biopic 'Bleed for This' Sells to Open Road". variety.com. Retrieved May 31, 2015. ^ Raup, Jordan (July 26, 2016). "TIFF 2016 Line-Up Includes 'Nocturnal Animals,' 'La La Land,' 'American Pastoral,' and More". The Film Stage. Retrieved July 28, 2016. ^ "Miles Teller Boxing Drama 'Bleed for This' Gets November Release". variety.com. May 3, 2016. Retrieved May 3, 2016. ^ D'Alessandro, Anthony (October 4, 2016). "'Bleed For This': Boxing Biopic Sticks & Moves To Wide Release In November". Deadline Hollywood. Retrieved October 5, 2016. ^ "Bleed for This reviews". Metacritic. Retrieved November 30, 2016.